JAKARTA, Indonesia – Fisheries and Maritime Affairs Minister Susi Pudjiastuti paid a visit to Greenpeace’s rainbow warrior at Sorong Papua yesterday to discuss a wide range of maritime issues with members of the NGO. Responding to Minister Susi’s question on the group’s focus this year, Head of Greenpeace Indonesia Leo Simanjuntak said that Greenpeace will continue its efforts on highlighting maritime issues regarding overfishing and human trafficking. After a two-hour tour and discussion around the rainbow warrior, Susi Pudjiastuti preferred that the group would establish a ship that is based on Indonesian waters. “You should assign one more environmental campaigning ship with its home base in Indonesia, which is thought is something crucial,” said the Minister. 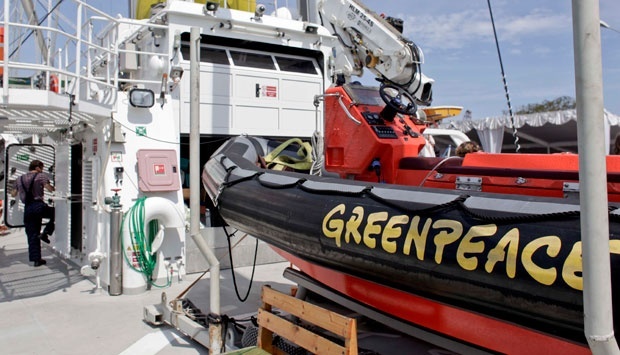 She argued that Greenpeace can highlight many important environmental issues that can prevent the current maritime situation from becoming even worse. “I have done my job in fighting-off 10,000 ships. The important thing now is to ensure that they won’t return again. SO, Greenpeace must station one main ship and another with an Indonesian flag,” said Susi. Susi Pudjiastuti also asserted the importance to focus on the efforts to prevent foreign fishing vessels from operating on Indonesian waters that often use environmentally damaging trawls, which can also collaborate with local governments.